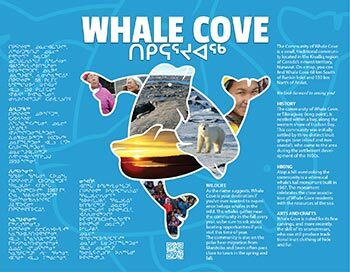 Whale Cove is led by a municipal government. The Hamlet Council, consisting of a mayor, deputy mayor, and eight councillors, meets twice a month to discuss Hamlet business, and issues. The community is managed by a Senior Administrative Officer (SAO) who oversees various departments such as Public Works, by-law enforcement, finance, community economic development, land use and planning, airport, recreation, and the Canada Post Agency.